Every year around the Christmas holiday, the U.S. Army lights up this huge star on the slopes of Mt. Gordon Lyon, a 4,100 foot high mountain 10 miles east of downtown Anchorage, Alaska. The star is made up of 325 ordinary 50 watt light bulbs, is a couple hundred feet across, and it can be seen from nearly everywhere in Anchorage. 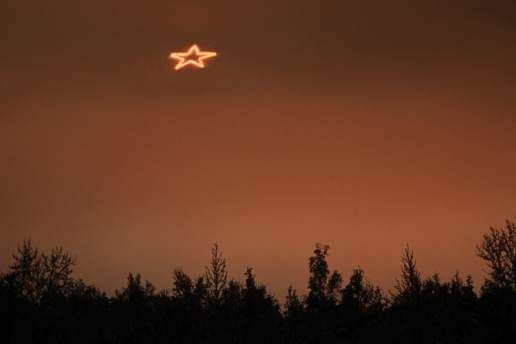 On this particular night, there was a layer of low clouds over town, but they were thin enough that the star stood out brightly above them. The unusual color is due to sodium vapor street lights illuminating the clouds from below.